Between the Undercroft and the Priory block, and set back just a few paces, is Hodgson’s Hall (no. 25 the Precincts), named after Richard Greaves Hodgson, Lower Master from 1871 to 1908. Gostling stated that “here the range is broken, a room (as tradition says) once called the dean’s great hall, having been demolished by the zealous puritans, for being profaned by the king’s scholars having acted plays there”. In fact two bays of the old brewhouse had collapsed in 1635 and were then replaced with this new building. The date 1659 is visible between the upstairs windows. 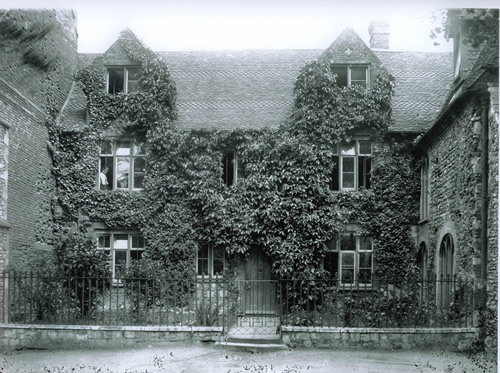 It has been used for various purposes including a chemistry laboratory and the Headmaster’s study. It is now the administrative and financial centre of the School, housing the Bursar’s Office.